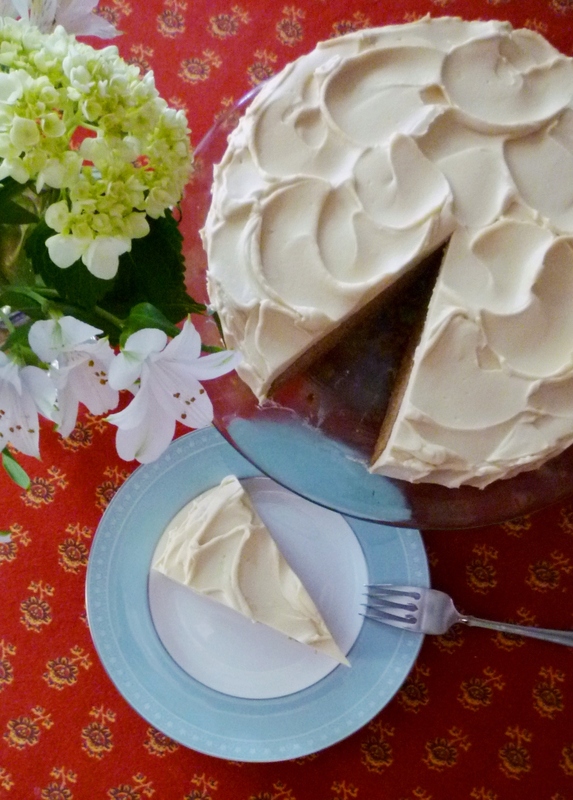 A few years ago I posted the recipe for my father's favorite birthday cake on what would have been his 75th birthday. Regular visitors might wonder why I have never posted my mother's preferred cake. The reason for this is that my mother doesn't really have a specific favorite. I associate white cake with butterscotch frosting with her birthdays from when I was a kid. But I don't think that this is really her favorite cake. 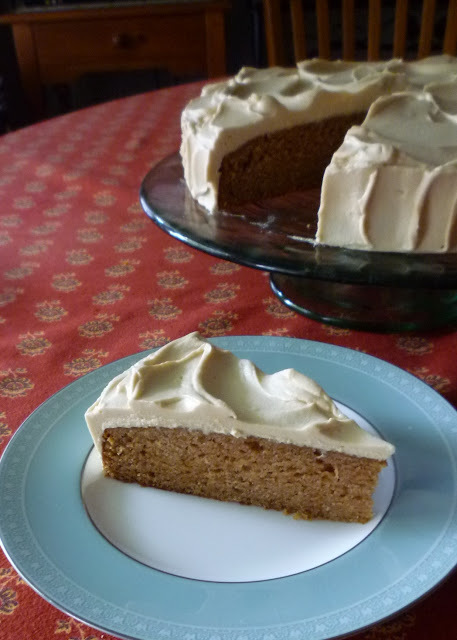 It is true that the butterscotch frosting is one of her favorite things, and probably her most frequently requested frosting, but more often than not she surprises me with her choice of cake. This year when I asked what she would like to have she requested an applesauce cake. I love applesauce cake. It falls into the same class of cakes as pumpkin (as well as zucchini, carrot, and banana) in that it is reliably moist and flavorful. And like pumpkin and carrot cakes, it traditionally includes a healthy dose of the autumn- and holiday-appropriate spices (cinnamon, allspice, nutmeg, cloves, and sometimes ginger) that everyone seems to love so much. All of these kinds of cakes are friendly and versatile—they can be dressed up into frosted layer cakes for birthdays...or left plain and served as an everyday dessert or as a simple accompaniment to an afternoon cup of coffee or tea. I even had a good recipe for applesauce cake at the ready. I developed it a few years ago using the recipe my mom made when I was growing up (from an old cookbook of my mother's called Mary Meade's Country Cookbook...by Ruth Ellen Church...see note) as my starting point. 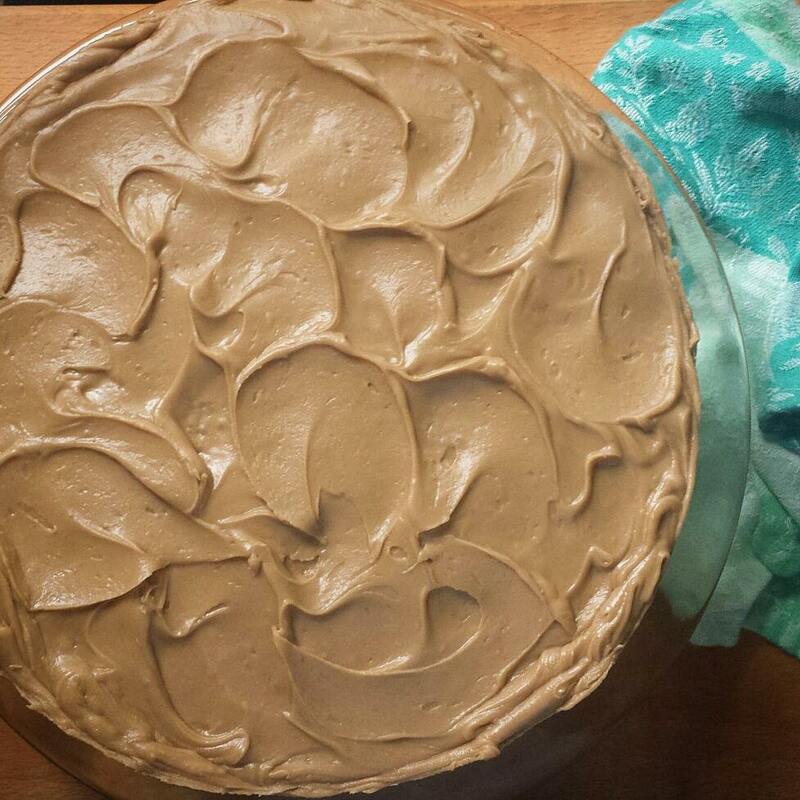 Not only is it a delicious cake, but it goes particularly well with cream cheese frosting (which I know my mom likes) and would allow me to get through the year without having to prepare any butterscotch frosting. I am always happy when I don't have to make that frosting. It isn't that I don't like it. 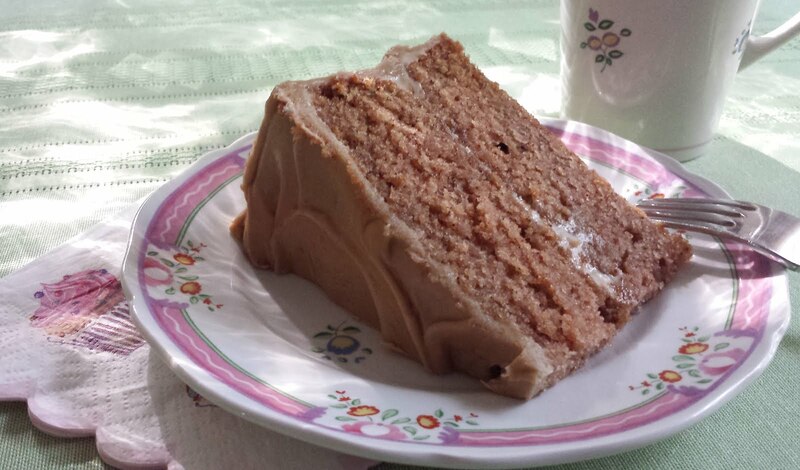 It is in fact quite delicious and goes well with white and yellow cake...as well as spice cake. I have even heard of serving it with chocolate cake, which frankly sounds fantastic since the frosting is very rich and sweet and would be served well by the bitter edge of a good chocolate cake. It is actually a classic frosting...and a southern favorite. Sometimes called caramel...or penuche...frosting, I have never heard it called butterscotch frosting by any family other than my own. But since it is rich with butter and brown sugar, it counts as butterscotch in my book. Despite its deliciousness, this frosting is a bit of a thorn in my side. It is an ostensibly simple recipe (simplified from versions that require the use of a candy thermometer and the making of a sugar syrup) with rather vague instructions. One is led to believe that nothing could be easier than making this frosting, when in fact making it is fraught with opportunities for failure ranging from a frosting that refuses to set up (and slides right off of the cake), to one that will suddenly turn into an unusable, cement-like mass. 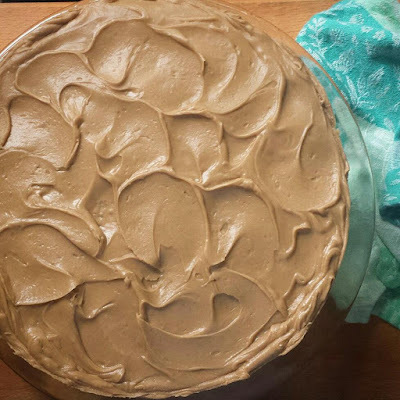 I have always intended to seek out a true recipe for a caramel or penuche frosting (made with the exacting specifications of a candy thermometer), but the fact of the matter is, this is the recipe that my mother loves, so this is the one I want to make for her. And as it happens, it is the one she requested to go with her applesauce cake this year. And I have to admit, it was a smashing combination. Everyone...but most especially my mother...really enjoyed it. So I am including the recipe in my post...with instructions that are as exact as I can make them. 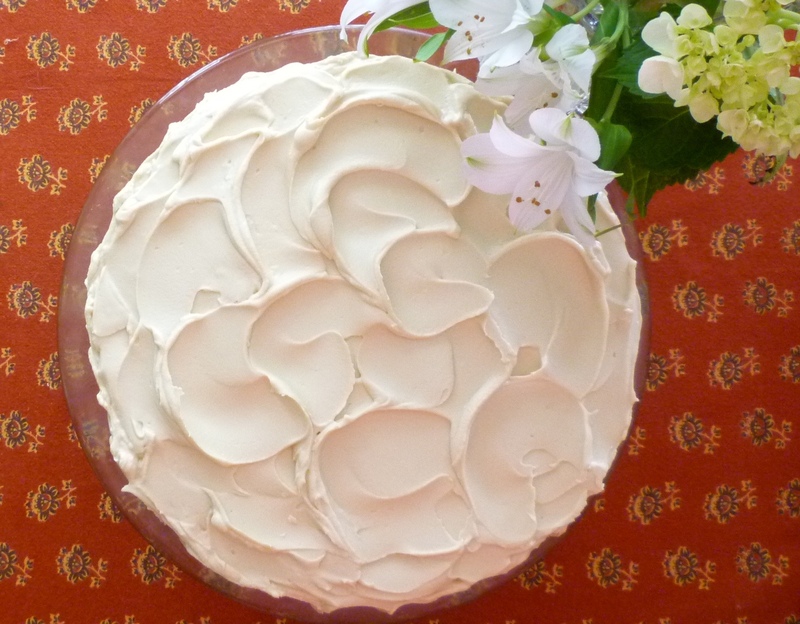 But I am also including a recipe for the cream cheese frosting that I love to serve on this cake. I think the cake would probably be pretty fine with a plain vanilla buttercream too. Finally, because I have a preference for single layer cakes that are wide and low, I am giving the recipe in the form that I usually make it—that is, in a quantity that is perfect for a single layer, 10-inch round. If you want to make a two layer cake (for a birthday, for example), you will need to multiply the recipe by one and one half and bake it in two 9-inch layers. The frosting recipes will similarly need to be multiplied by one and one half. The cake was almost completely devoured at my mother's party. It was so good that I prepared it again so I could post it here (and so I could have more!). It is a perfect cake for autumn and if you make it, I think you will love it...no matter which frosting you choose. Grease a 10-inch round cake pan, line with a round of parchment and grease the parchment. Flour the pan. Set aside. Sift the dry ingredients together and set aside. Using a stand mixer fitted with the paddle attachment, cream the butter with the sugar until light and fluffy, stopping the mixer once or twice to scrape down the sides. This will take 3 to 5 minutes at medium-high speed, depending on the ambient temperature of the room. Beat in the eggs one at a time, scraping down the sides after each addition. Increase the speed to medium-high and briefly beat until the mixture lightens in color and expands in volume. Fold in the dry ingredients (by hand or on the lowest speed with the paddle attachments) alternately with the applesauce (add the vanilla with the first half of the applesauce), beginning and ending with the dry ingredients. Scrape the batter into the prepared pan and smooth the top. Bake in a preheated 350° oven until golden, springy to the touch and a toothpick inserted in the center comes out clean—about 35 to 45 minutes. Let the cake cool in the pan for 10 to 15 minutes. 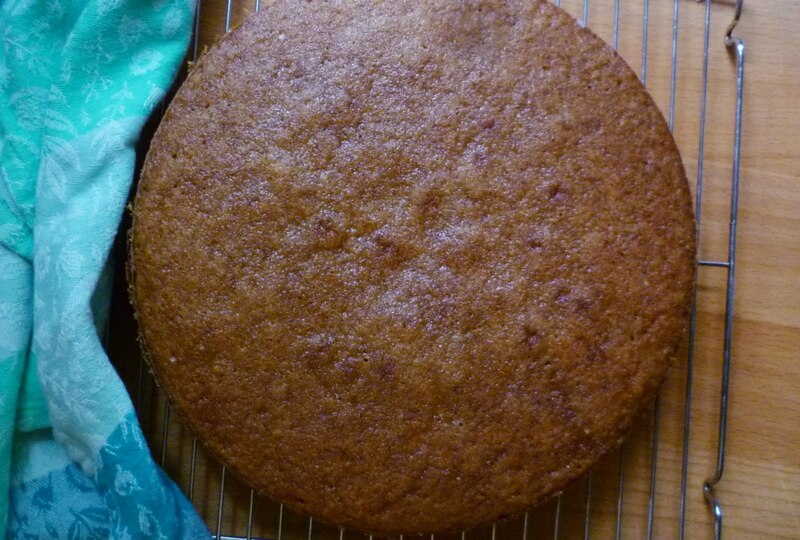 Loosen the sides of the cake by running a thin knife around the edge of the pan. Turn the cake out of the pan. Cool the cake on a wire rack. 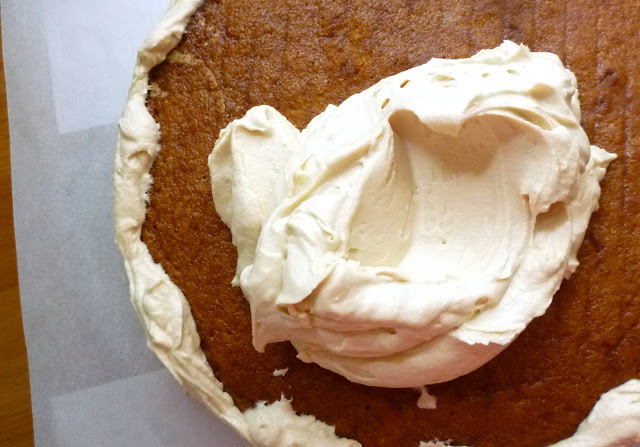 Frost with Maple Cream Cheese or Butterscotch Frosting. Serves 12. Variation: This recipe makes a beautiful layer cake. Make 1 1/2 times the recipe and bake in 2 9-inch layers (they will take about 5 minutes less time to bake than the large 10-inch cake). You will also need to multiply the frosting recipe by 1 1/2 so you will have enough to fill in between the layers. Using a stand mixer fitted with the paddle attachment, beat the butter with the brown sugar until smooth. With the mixer running, drizzle in the maple syrup. Increase the speed to medium-high/high and beat until very light and fluffy—5 minutes or so (the color of the mixture will become a very pale beige). Add the cream cheese and beat until the frosting is totally smooth and fluffy. Cream cheese brands vary widely in texture. If yours is stiff/firm straight out of the fridge, let it sit at room temperature until it becomes malleable. I use Kraft's Philadelphia, which seems to always be fairly malleable at refrigerator temperature. This recipe makes a very light and fluffy frosting. If you prefer a denser, more traditional cream cheese frosting (with maple), use the one from my Chocolate Gingerbread post. Place the butter in a medium sauce pan and melt over moderate heat. Add the brown sugar. Bring the mixture to a boil over moderate to moderately high heat, stirring to make sure it doesn't scorch. Boil for 2 minutes, stirring constantly. Add the milk and return the mixture to the boil. Remove from the heat; cool to room temperature. Scrape the cooled syrup into the bowl of a stand mixer. Add 1 3/4 c./170 g. of the powdered sugar and mix using the paddle attachment until the sugar is absorbed. Beat briefly. If the mixture isn't thick enough to spread, add the remaining powdered sugar a spoonful at a time, beating until thick enough to spread. Use immediately—the frosting will continue to set up as it sits. You must sift the powdered sugar or you will have lumps in the finished frosting. The syrup must be cool or you will end up adding too much powdered sugar and the frosting will suddenly set up like cement (much swearing will ensue). You must use the frosting immediately when it is ready. It should be soft and spreadable when you start. DO NOT LET IT SIT FOR ANY LENGTH OF TIME once it is ready. Get it on the cake as quickly as you are able (have everything ready to go...cake on the platter, spatulas/palette knifes/etc.). Put it where you want it...swirling it attractively as you go. It is unlikely you will be able to go back over frosted areas and add decorative swirls (unless you are experienced and fast). This frosting crystallizes and sets up into a (delicious) brown sugar fudge very quickly...failure to get it out of the bowl and onto the cake quickly will result in much frustration/bad language/etc. I'm so pleased you liked it!...the cake AND the butterscotch frosting. Thank you for taking the time to let me know...and Happy Thanksgiving!